.com â€” Home Page Advantage Pop-Up Menu â€” over 30,000,000 impressions for a very low $1 CPM. A great place to advertise well-known brands â€” our clients who publish a popular diet book loved it so much that they doubled the length of their campaign after first-wave results came in. â€“ Consistently a great place for books. It can nicely complement a television campaign and is extremely targeted. We have run many campaigns for everything from vampire books to children’s books, with great success. â€” A good place to reach a broad audience for a relatively inexpensive CPM. News sites do a great job of increasing awareness about books in many bestselling genres, from business to fiction. Phone Kiosks / Billboards â€” Phone kiosks continue to be an affordable way to advertise books. We can target by city and even by neighborhood, and kiosks start for as little as $250 each. We’ve recently secured some great deals on billboards in NY and LAâ€”on Sunset Blvd in LA, and Times Square for as little as $40,000 for 4 weeks. Rolling Stone â€“ For the first time in their history, Rolling Stone has dropped their print rates for us. We can now run a color ad for as little as $20,000 that will reach the magazine’s full 1.5 million readership. It may be known as a music magazine, but it has strong political and cultural reportage, and reader studies show that people who read Rolling Stone also read books. Haven’t seen the magazine in a while? Let your AE know and we’ll get you on comp. The Week â€“ A fabulous place for books. They dedicate about 10% of their edit to books, feature a different author’s favorite books each week, and reach an affluent, educated audience. We have great negotiated rates and can run an ad for as little as $8,000. New Yorker — It’s always worth remembering that the New Yorker offers a full page 4/c ad for less than $45,000. The critics rate for a 1/3 page is about $11,000. And did you know that we can buy the New Yorker by region? BBC.com â€“ Another great place to reach a literary, affluent audience. We can behaviorally target to literary and entertainment enthusiasts. 74% of their users have purchased a book in the last 6 months. Arthouse Movie Network â€“ We feel that there’s a strong correlation between people who see movies (especially the kind of movies in the Arthouse network) and people who purchase books. And you don’t even need a produced spot to run in theaters. We can run :15 second flash ads â€“ significantly cheaper to produce than standard broadcast quality ads â€“ and you can run them in over 70 theaters on over 400 screens, for less than $25,000. .com â€” Do you know about the “Home Page Advantage Pop-Up Menu”? It delivers over 30,000,000 impressions for a very low $1 CPM, and it’s a great place to advertise well-known brands. Our clients who publish a popular diet book loved it so much that they doubled the length of their campaign after first-wave results came in. â€” These general news sites are not only a good place to reach a broad audience for a relatively inexpensive CPM, but they also do a great job of increasing awareness about books in many bestselling genres, from business to fiction. In the age of complexity, we respond to simplicity. This is as true for good ad design as it is for services like Google search and products like Apple’s iPhone. But two forces, one a legacy of print and the other from the bleeding edge of technology, are leading to more and more complex ads, and this is not necessarily a good thing. In a recent article in Ad Age, ad-effectiveness researcher Philip Sawyer observes that declining click-through rates in display ads may be stemming from increasingly complex ads. Part of the problem is that technology allows creative departments to do so much more now than we ever could before. From expanding boxes to in-banner video to data-intensive flash tricks, it’s suddenly affordableâ€”both in ad cost and memory costâ€”to produce exceedingly fancy digital ads. There’s a natural temptation to use all the tools at your disposal for every adâ€”as if a banner that uses 100k memory is somehow necessarily better than one that only uses 20k. But complexity is often the enemy of communication. But the other reason for the complexity is specific to book publishing’s history of print ads. Everybody in publishing knows that the right review in the right place can sell books. So it’s only natural that most print ads are driven by review copyâ€”often trying to pack as many glowing reviews into a space as possible. This can be a highly successful tactic that takes full advantage of the print medium’s relatively large space and its audience’s long attention span. But that strategy must shift in the digital sphere, where ads run in a busy, ever-changing context, and where viewer attention-spans are wickedly brief. 1. They are too complex. 2. They take too long to get to the point. 3. They are ambiguous. 4. They are visually bland — or, worse, ugly. 5. They use Flash for the sake of Flash — not for a clear purpose. 6. They are often difficult, if not impossible, to read. 7. They are bereft of benefit statements. This may explain why we occasionally see quick-and-dirty static .gifs perform better than labor-intensive flash masterpieces. When there is only one panel to work with, it imposes a discipline that fosters simplicity of approach and directness of message. And this is why some of our best performing ads did not feature quotes, but a simple free offer. The best digital ads get right to the point, whether it’s an offer, a deal, or even if the point is simply “Critics Rave.” Leave the details for the click through — no matter how great the adjectives nor (especially!) the lengths the reviewer goes to shower praise. In spite of all the energy marketers are dedicating to harnessing the power and promise of new media, America remains a nation firmly entrenched in front of its television set. There remains no better way to reach a large, mass audience than by advertising on this time-honored medium. But while the incredible reach of TV advertising is alluring, the cost is often prohibitive to book publishers. Cable channels can provide a cheaper, more targeted alternative to network buys, but even this requires a significant investment that is not always possible for publishers with large lists and limited marketing budgets. In our ongoing search for new and more effective ways to advertise books, Verso is working with a new media partner that specializes in promotional television sponsorships. Extremely cost efficient and providing tremendous reach and frequency for a relatively small out of pocket, these “sponsorships” are essentially remnant ad space offered on a specific cable provider on a per market basis. For example, a recent Verso campaign purchased both Verizon Fios and RCN in NYC and a different campaign purchased Comcast in San Francisco and Cox in Washington DC. Unlike true remnant inventory the spots provided will always air between 6am to midnight. Furthermore, our most recent campaign (targeting adults 50+) saw our spots running on highly rated and commercial programming such as Anderson Cooper 360, Larry King Live, Glenn Beck, The Dog Whisperer, Man vs. Wild, Desperate Housewives (Lifetime) and Grey’s Anatomy (Lifetime). Our campaigns have paid high dividends with strong returns on investment. A December â€˜09 campaign saw a $21k spend across five major markets yield $238k-worth of inventory and almost 14 million impressions. A smaller campaign in January ’10 saw a $7k spend in a single market yield $170k worth of inventory and almost 7.8 million impressions. The nature of the promotional model does not permit for precise demographic or program specific targeting. However, by relinquishing this bit of control from a TV campaign we are able to dramatically expand the reach and frequency of our message. Whether as a vehicle for expanding an existing TV campaign’s audience or as a means of getting a book with a small budget in front of an otherwise impossible number of eyeballs, promotional TV offers a unique solution for publishers. In our ongoing search for new and more effective ways to advertise books, Verso is working with a new media partner that specializes in promotional television sponsorships. Extremely cost efficient and providing tremendous reach and frequency for a relatively small out of pocket, these “sponsorships” are essentially remnant ad space offered on a specific cable provider on a per market basis. For example, for one recent campaign, we purchased both Verizon Fios and RCN in NYC; for another campaign, we purchased Comcast in San Francisco and Cox in Washington DC. Unlike true remnant inventory the spots provided will always air in the strongest dayparts, between 6AM and midnight. Furthermore, our most recent campaign (targeting adults 50+) saw our spots running on highly rated and commercial programming such as Anderson Cooper 360, Larry King Live, Glenn Beck, The Dog Whisperer, Man vs. Wild, Desperate Housewives (Lifetime) and Grey’s Anatomy (Lifetime). We all agree that in order for an ad to be effective, it must first be seen or read. Verso and HarperCollins had a unique opportunity to learn, through the magic of actual consumer research, just what kind of impact a specific print ad had on readers. On December 9, 2009 HarperCollins ran a full page four color ad for Michael Crichton’s novel Pirate Latitudes in The Wall Street Journal. As luck would have it, the ad was running in an issue that had been designated a “Starch” issue. Simply put, this meant that our ad would be part of a consumer survey conducted by Starch Research in which Journal readers who agreed to cooperate would be asked about their reactions to each of the ads in the designated issue. It is not often that we are able to participate in this kind of study and so we anxiously looked forward to what might be revealed to us. As it turned out we had to wait a couple of months for the completion of interviews and compilation of the information, but we were delighted with the results. Out of the 51 ads in that day’s paper, the one for Pirate Latitudes ranked #19 in the category of “remembered the ad on their own and commented on it.” This put us 10% above index (110). Not bad. But as the interviews focused more intently on the content of the ad, Pirate Latitudes pulled ahead of the pack. In the area of “Read Some” (people interviewed who read any part of the ad’s copy) we indexed 121, the fourth highest rank among all the advertisers. And in “Read Most” (people interviewed who read half or more of the written material in the ad) we indexed 121 for a ranking of number 2! The lesson seems to be that the best way to get the notice of consumers in print is with compelling graphics and engaging copy, and that in a world full of products vying for our attention this is how we might have an impact on the decisions of potential purchasers. Book publishers, after all, excel at giving readers a deeply satisfying immersive experience. Their print ads should aim for the deepest level of reader engagement as well. #f8981d" title="PirateLatitudes" src="http://www.versoadvertising.com/inverso/wp-content/uploads/2010/04/PirateLatitudes.jpg" alt="PirateLatitudes" width="285" height="518" srcset="https://www.versoadvertising.com/inverso/wp-content/uploads/2010/04/PirateLatitudes.jpg 285w, https://www.versoadvertising.com/inverso/wp-content/uploads/2010/04/PirateLatitudes-165x300.jpg 165w" sizes="(max-width: 285px) 100vw, 285px" />We all agree that in order for an ad to be effective, it must first be seen or read. Verso and HarperCollins had a unique opportunity to learn, through the magic of actual consumer research, just what kind of impact a specific print ad had on readers. 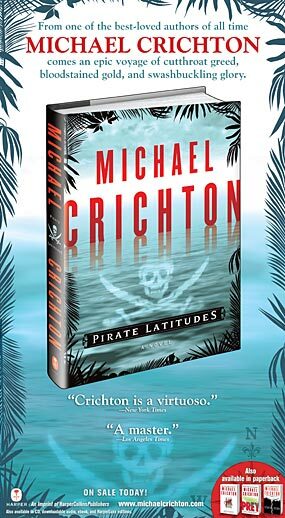 On December 9, 2009 HarperCollins ran a full page four color ad for Michael Crichton’s novel Pirate Latitudes in The Wall Street Journal. As luck would have it, the ad was running in an issue that had been designated a “Starch” issue. Simply put, this meant that our ad would be part of a consumer survey conducted by Starch Research in which Journal readers who agreed to cooperate would be asked about their reactions to each of the ads in the designated issue. It is not often that we are able to participate in this kind of study and so we anxiously looked forward to what might be revealed to us. As it turned out, we had to wait a couple of months for the completion of interviews and compilation of the information, but we were delighted with the results.